That’s exactly what happened when I found Happy DAYA Stickers. I stumbled across it by accident thanks to an Instagram post of someone I was following. I think within 24 hours of first finding the shop I had placed my first order. That’s never happened before. Normally things sit in my basket for ages before I hit the button. I prepared for a long wait (the estimated shipping time was weeks) but was presently surprised when my order shipped just a few days later. Just over a week after ordering, I had my goodies! There was way too much choice and it took me a while to whittle my choices down to keep it under the customs threshold. At less than £2 a sheet (plus 10% off with an Instagram code) I was able get a decent amount of sheets. These stickers are super cute. They’re exactly the kind of art style I love. You can also choose the size of the stickers meaning you can pick up a size suitable for any planner. These are the mini and fit perfectly in my new Hobonichi. The script stickers aren’t available in any other sizes, but I couldn’t pass up those cute ‘pack orders’ stickers! I don’t even go out to breakfast all that often but I had to have those cute breakfast stickers. There’s a whole range of the little room stickers you can see on the left. The office ones I’m going to use to mark busy shop and blog days as that’s where you’ll find me on those days. I tend not to purchase stickers based on the freebies, they’re just an added bonus. 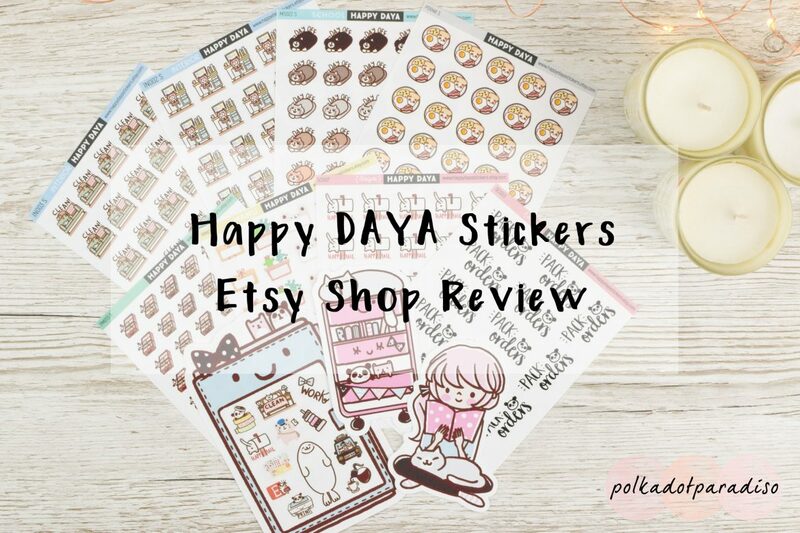 I had no idea the ones from Happy DAYA Stickers were so generous though! The good sized sticker sheet and die cuts are adorable. I especially love the Raskog one. These seem to change every month and so even though I’ve already loaded up my Etsy cart for a second order, I want to wait until the next freebies are out! These are really reasonably priced, have gorgeous artwork and come with lovely freebies. As if all that wasn’t enough the quality of these is also fantastic. The cuts are perfect, the paper is thick and the adhesive is strong (I’ve had other stickers peel up in my planner). I love these stickers so much I literally reloaded my cart the morning I received my first order. If you want to see how I’m using these, be sure to follow me on Instagram where I share all my planning spreads. I’m always on the lookout for new Etsy shops, so if you know of one I’ve never reviewed before that you think I’d like, drop it in the comments below!